So You Got the Job! WTF Is Next? Synopsis: Mr. Link is the altogether lovable and hilarious title character in this globe-trotting comedyadventure. Hugh Jackman is Sir Lionel frost: a brave and dashing adventurer who considers himself to be the world's foremost investigator of myths and monsters. The trouble is, no one else seems to agree. He sees a chance to prove himself by traveling to America's Pacific Northwest to discover the world's most legendary creature. A living remnant of Man's primitive ancestry. The Missing Link. Zach Galifianakis is Mr. Link: the slightly silly, surprisingly smart and soulful beast who Sir Lionel discovers. As species go, he's as endangered as they get; he's possibly the last of his kind, he's lonely, and he believes that Sir Lionel is the one man alive who can help him. Together they set out on a daring quest around the world to seek out Link's distant relatives in the fabled valley of Shangri-La. Along with the independent and resourceful Adelina Fortnight (Zoe Saldana), who possesses the only known map to the group's secret destination, the unlikely trio embarks on a riotous rollercoaster ride of a journey. Along the way, our fearless explorers encounter more than their fair share of peril, stalked at every turn by dastardly villains seeking to thwart their mission. Through it all, Mr. Link's disarming charm and goodhumored conviction provide the emotional and comedic foundation of this fun-filled family movie. ● The production design can best be described as "epic", "colorful" and "highly stylized". Most people think of the Victorian era through its reproductions such as sepia photographs or ink drawings, however in reality it was a richly colorful time, especially as it transitioned into the Twentieth Century. ● Missing Link's production design found inspiration in Victorian patterning such as elaborate wallpapers and textiles. These patterns occur throughout the film, from the roof tiling to the leaves of trees. ● There is a unique and highly stylized design of characters and objects that carries through the film. All of these stylised shapes and designs can be broken down into a rule of thirds. For example, Sir Lionel's long legs are two thirds of his frame. The "Nessie" monster's eyes are in the top third of her face. This 'rule' allows for a consistency across continents and cultures and creates the unique world of the film. ● Another design influence was the photography of National Geographic magazine, which brought vibrancy, adventure and new cultures into homes. The film heightens this unique, almost exaggerated color (with the exception of the somewhat colorless Optimates Club, which is stuck in its very definitive 'black and white' world view). ● Stop-motion puppets are typically built between 1/5th and 1/6th the size of their human-scale characters. This allows the internal structures to be strong enough to withstand a 2-year film shoot while the outer details are large enough to withstand the scrutiny of a cinematic camera and projector. ● All of the puppets for Missing Link were built approximately 20% smaller than the puppets of previous LAIKA films. 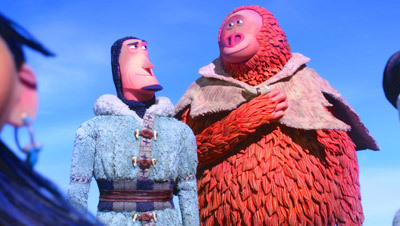 This scale difference allowed sets to be smaller and also kept Mr. Link, the largest character in the film, at an animator friendly size of 16" tall. ● The puppets for the elephant and the horse were constructed using a "bodysuit" technique in which muscles are first carved from foam, rubber and plastic and attached to the internal skeleton. A thin outer skin of silicon is stretched over the entire body, then hand painted and detailed. ● Each puppet utilized a unique jetpack - a remote turnbuckle device fitted to the hips and the small of the back - which allows for very small incremental movement by the animators. ● First puppet to be constructed with a stretchy/baggy skin not adhered to the moveable carbon fiber body panels. ● Weighs in at approx. 36 lbs. ● Has a specialty stunt foot created with open cavities to create the illusion of weight and compressed flesh. It features 100% independently sympathetic toenails. ● Has an interior rack and pinion neck for head lift. ● Uses a gas-powered spring to assist in lifting the hips. ● The elephant saddle, or howdah, which carried Sir Lionel and Adelina, was on a 2-axis motorized rig to provide illusion of the bounce of the elephant's walk. ● Only one elephant puppet was created for the film. ● Sir Lionel's Horse utilized a custom-created semi-circular rig which transferred the central pivot point of the horse to the outside of the puppet. This allowed the animator to capture the look of the weight-transfer that is unique to a horse's gait. ● Is the heaviest lead character ever created for a LAIKA film. ● The shot of Mr. Link pulling up his pants while jumping was achieved by swapping whole puppets between frames to achieve zipper closure. ● The pants splitting shot was achieved with a specialty-built rig to support a 300% scale Mr. Link rear end. Winders provided tension to pull the fabric seam apart and push the tuft of hair to the exterior. ● The shot of the inside of Mr. Link's mouth utilized 6 incremental driver paddles to manipulate the tongue, winders to pull open the skin of the cheeks, and another set of winders to allow for opening and closing of the jaw. The entire mouth was constructed at 500% scale with rapid prototype teeth and gums. ● Required 180 individually rigged and motion-controlled tassels. ● Rumble seats were constructed to provide 6-axies of movement per each puppet. ● The seats, curtains, and movement of the carriage utilized a total of 40 individual remotely controlled programmable motors. ● Because the characters are seen walking down the center aisle, the set does not have a floor. Instead, the entire set is suspended and moved on rails for animator access. ● The exterior train is an actual working train on rails that was pulled by a motorized winch. It ran too smoothly along the rails, so bits of tape painted to look like rust were added to the track so that the wheels would bump along for more authentic carriage motion. ● The ship set was too big and heavy to move, so the camera and all of the surrounding lighting was motorized to move around the ship to create the illusion of motion. ● The smallest camera head used at LAIKA was built for this set. It allowed the camera to be mounted to a long pole and then sent down inside the long corridor of the ship to capture animation. ● Writer/ director Chris Butler also designed the characters ...he's a triple threat on Missing Link. Costume Guild nominee Deborah Cook (the only animated movie costume designer ever nominated for this prestigious award) designed all the costumes. ● On the outside, Mr. Link is loveable and friendly. On the inside, he's a nest of metal parts including a mechanical belly mover, a chest breather, squash and stretch devices, worm gears, and racks and pinions. ● Mr. Link's fur was created with several techniques. His general body mass is first established by building up pieces of perforated foam latex onto his metal armature (almost like muscles). Then, like a skin or a fur suit, sheets of molded silicone with the fur texture are applied over this body shape and glued closed. ● Due to the extreme amount of mobility and squash and stretch needed in Link's neck, we used individual cast urethane "fur petals" that we attached in layers similar to the way feathers lay on a bird's neck. When Link twists and bends, these layers slide over and past one another rather than buckle and fold as they would if they were a single sheet of molded silicone. ● After all the fur is attached, a beautiful and intricate paint job is applied to add depth and highlight individual hairs. ● Mr. Link's plaid suit is a nod to Northwest clothing conventions of the day, as well as weaving history, specifically White Stag and Pendleton which were established in Oregon during this time period. ● Many fabrics are constructed from a very lightweight stretchy fabric base dyed to a particular base color, digitally embroidered to give it an even woven texture in miniature scale, then finished with a print overlay and hand-painted detail. ● Costume Designer Deborah Cook: "All fabrics for LAIKA costumes are created in-house. Nothing is bought off the shelf. Not only do we need to create costumes on a miniature scale, they need to withstand the puppet performances. And they also need to look good on camera. A lot of experimentation in textile creation happens here, to produce these intricately detailed costumes." ● Finding the pattern for Sir Lionel's houndstooth suit started out by working with an expert weaver to establish the size, shape and color tones of the interlocking shapes that would represent this weave. ● However, small weaves or very close parallel lines can produce a moiré effect on screen – a visual perception interference produced from the digital shooting process. Through much experimentation, the costume designer developed the color tones for one not to appear more prominent than the other on screen and the shape of them to give the impression of woven houndstooth but be formulated from an interlocking 'star' shape. ● The rich blues and yellows of Lionel's suit reflect his modern, fashion-forward sensibilities. ● Adelina represents the modern woman at the turn of the 20th Century. Independent and adventurous, this revolutionary woman was popularized with the "Gibson Girl" illustrations of the late 19th and early 20th centuries. ● Adelina's hair uses nearly 2,000 feet of multi-colored silk thread in various colors (over 1/3 of a mile) which are then blended and styled by hand to mimic the shapes and linear qualities of the pen and ink illustrations of the "Gibson Girl" look. ● Another signature look of the "Gibson Girl" was the swan-bill corset, a reaction against the physically restrictive bustles and corsets of the Victorian era. This corset exaggerated women's curves, something that Victorians would have found "unacceptable." Adelina was a keen adopter of the modern swan-bill style. ● The fuchsia of Adelina's dress also conveys her fashion-forward style. The first chemical dyes were created in this period allowing for vivid hues like purples and blues. Her and Sir Lionel's colorful dress-sense offers a stark contrast to the Victorian staples of navy blues and charcoal greys. ● There were more than 110 sets and 65 unique locations. ● The bagpipes were made with a specially-built latex balloon which was inflated and deflated through syringes. ● There were 64 individually rigged ice blocks which could be independently controlled for the shot in which the ice bridge begins to break. ● The (exterior) train was the largest prop built for Missing Link. ● A multitude of custom-made and unconventional materials were used in creating the landscapes in the film, such as silk-screened and laser cut craft paper, textured fabrics, plastic beads, tissue paper, miniature railroad materials, goat hair, foam balls and black light paint. ● The reins, bridle and saddle on the horse are made from real leather that had been thinned down dramatically to achieve the required scale. Many of the books in Lionel's study were also leather bound using authentic bookbinding techniques. ● Stop-motion animation is the manipulation of physical objects in small increments between individually photographed frames so that they appear to exhibit independent motion when played back in sequence. In practice, the animator moves the object, takes a picture, moves the object, takes a picture, and so on. ● LAIKA animators photograph the maximum number of increments for cinema projection, 24fps, frames per second. In industry vernacular, this is known as "shooting on ones". That means for every second there are 24 unique poses an animator creates. LAIKA is likely the only stopmotion feature studio in the world that shoots on ones, as a rule. 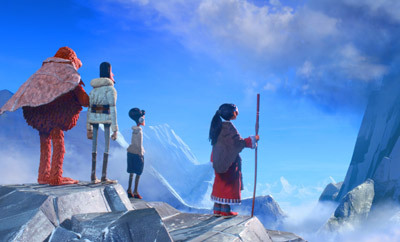 LAIKA films hew closely to the "naturalistic" style, which requires the painstaking technique of shooting on ones. ● The Animation Tracker software and controller, newly developed for Missing Link, use a series of knobs which are linked to encoders on motors. An animator can use the controller to remotely move elements on sets. (This was used extensively in animating the Elephant, for instance.) The software provided a visual graph, mapping of the position of the Elephant, and allowed the animator to compare that position to prior frames. ● LAIKA artists build sets and props at larger or smaller scales to allow for different perspectives of the puppets. While this was again done on Missing Link, miniature 3" tall replicas of puppets with tiny armatures were also built for the first time on a LAIKA film, to allow for the animators to perform for an extreme wide shot in the Himalayas. ● Nearly a year before filming began on Missing Link, LAIKA was testing brand new, as yet unreleased color 3D printing technology called the J750 printer, made by Stratasys. Although LAIKA had been using Stratasys 3D color printers since its second feature, ParaNorman, this new technology from Stratasys is revolutionary, allowing for unprecedented accuracy and detail. In order to precisely control each 3D pixel (voxel) LAIKA partnered with Fraunhofer, a German research facility in their development of advanced 3D slicing software, Cuttlefish. ● LAIKA is considered a leader in the use of Rapid Prototyping (RP or 3D printing) for facial animation and was awarded a Scientific and Technical Oscar ® in 2016 for its innovation in the field. By partnering with Stratasys to provide the hardware and Cuttlefish to provide the software, LAIKA once again displays its leadership position in the use of 3D printing capabilities in cinema. ● Missing Link is LAIKA's first film to use full-color resin 3D-printed replacement faces on ALL of its puppets. ● Missing Link is LAIKA's first film to 3D print custom animated facial performances for every character in every shot of the film. Past films relied on "face kits" with interchangeable facial expressions that were re-used throughout the film. ● The RP department's five 3D printers often ran 24 hours a day churning out approximately 2,000 faces per week for Missing Link. ● The RP department printed over 106,000 faces in total for Missing Link. ● The three main characters comprised about 75% of the faces in the film. ● Due to the improved surface detail of Stratasys' J750 3D printer almost 90% of the faces printed for Missing Link did not require sanding. After printing, support material was removed, magnets installed and the faces were sprayed with multiple layers of a clear and dull coat for a smooth finish. Lastly, each face was organized, tested and then delivered to set. ● The silicone fur surrounding Mr. Link's face was animated through replacement animation. By removing and replacing a 3D printed "ring", the fur would change shape. Each 3D printed ring was designed to make sure the fur properly matched the shape of all of his 3D printed faces. ● At peak production, there were 91 units in production - about 50% more than any other LAIKA film. ● In the ice pit, there is a shot in which Mr. Link's face is reflected in multiple facets of an ice wall. To achieve this, an array of 10 cameras was set up to simultaneously capture each individual reflection at a different angle. ● The Logging Town was so large that a combination of miniature and full-scale sets were combined to achieve the distance of the town viewed from afar. The shooting of the full set required closing down an aisle within the studio and placing the camera rig across the walkway to encompass the shot. ● There are 47 motion control camera rigs in-house. ● The oldest motion control camera rig at LAIKA dates from 1928. Originally used to hold a Technicolor 3-stripe live action camera, it has been passed down through various effects studios for over 90 years. ● The shot of the elephant walking required a 35ft long path and a motorized crane over 14' tall with a reach of 12't to support the puppets. The wraparound nature of the camera motion meant that one side of the set had to be shot first and then struck. Then the other side of the set was installed and shot to completion. It required almost three months to shoot, and is approximately 20 seconds in length in the film. 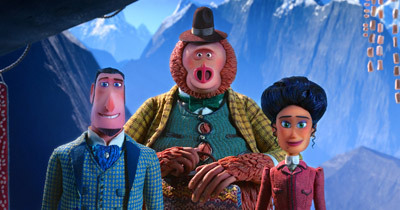 ● There were 1486 shots in Missing Link - the most of any LAIKA movie to date. 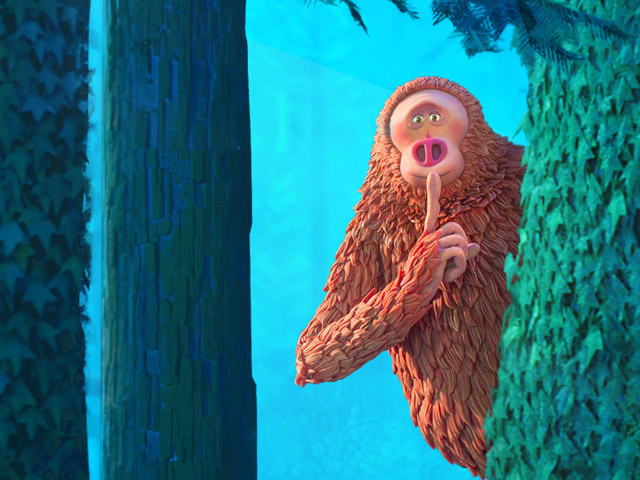 ● Of the 1486 shots in Missing Link, only 446 were 2D rigs and seams clean-up only. 465 shots required CG set extensions, 460 required CG special effects, and 325 required CG animation. ● The VFX Asset team created 531 CG assets and 182 CG characters for Missing Link, both the most of any LAIKA film. By comparison, for Kubo and the Two Strings, 249 CG assets and 77 CG characters were created. ● There were over 1,000 rigs removed from shots by the VFX Paint team. ● The opening shot of the movie, the Loch Ness reveal, had more than 400 elements in the final comp. The average shots with water used over 100 practical and cg elements to produce the final image. ● Each underwater Loch Ness plankton simulation in Nuke had more than 2 million particles. ● One simulation volume for the stormy ocean water splash contained the maximum number of voxels (3D pixels) that Katana, our lighting software, could handle - which is 3 BILLION. ● The VFX Department used over a petabyte of storage – that's a million gigabytes, in the creation of Missing Link. ● Missing Link took 112 million processor hours – 12,785 YEARS – to render the entire movie and went through five architectures of the render farm. ● The CG Ice Bridge model asset is composed of 37,000 parts, 20,000,000 polygons, 48 UDIMs and takes 4.7GB of memory when fully loaded. ● Two different icicles were used to achieve the cracking effect -- a plastic resin version and a silicone version that was photographed separately to recreate the look of cracking ice. Both were captured in multiple lighting scenarios and upwards of 20 stage passes per shot were delivered to VFX.